was a contest/poll that was conducted by the Spanish Television Company Antena 3 and the radio broadcaster Cope. The final results were announced on 31st December 2007. I thought it might be interesting to take a look at the eight out of the twelve that I have visited and having completed that I thought I might come up with a personal alternative twelve. 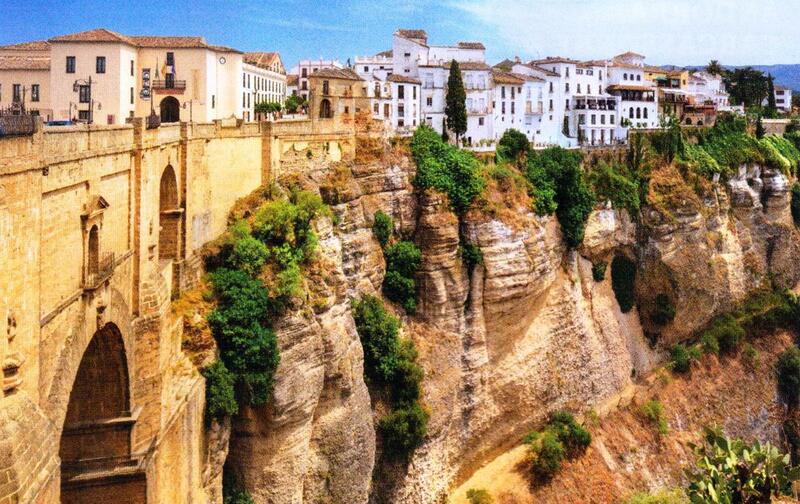 For my number four in the countdown I have gone back to the south of the country and the town of Ronda. I went to Andalusia in October 2003 to play golf and stayed near Marbella on the Costa del Sol. I have to say that I didn’t really care for Marbella or Puerto Banus next door, it seemed to be just one long ribbon of inappropriate concrete resorts and an impatient motorway rushing by. It didn’t help that it seemed to rain continuously and the weather was so poor that when it was impossible to play golf or go to the beach it was necessary to find alternative things to do. Sometimes that is not so bad and on one disappointing weather morning that ruled out golf we took a drive to Ronda in the mountains and away from the tourist traps on the coast. This involved a forty-five kilometre drive from our holiday accommodation at Los Aqueros golf and country club through the Sierra Bermeja mountains as we climbed continuously along a dramatic road that clung to the side of the mountains like velcro and zigzagged dramatically all of the way to our destination. There was light rain and some low clouds but we could just about make out the coast line and the sea as we drove through first oak and then pine forests of this protected ‘natural area’ of outstanding beauty. It took about an hour to reach Ronda, which is one of the pueblos blancos (white towns) so called because they are whitewashed in the old Moorish tradition. 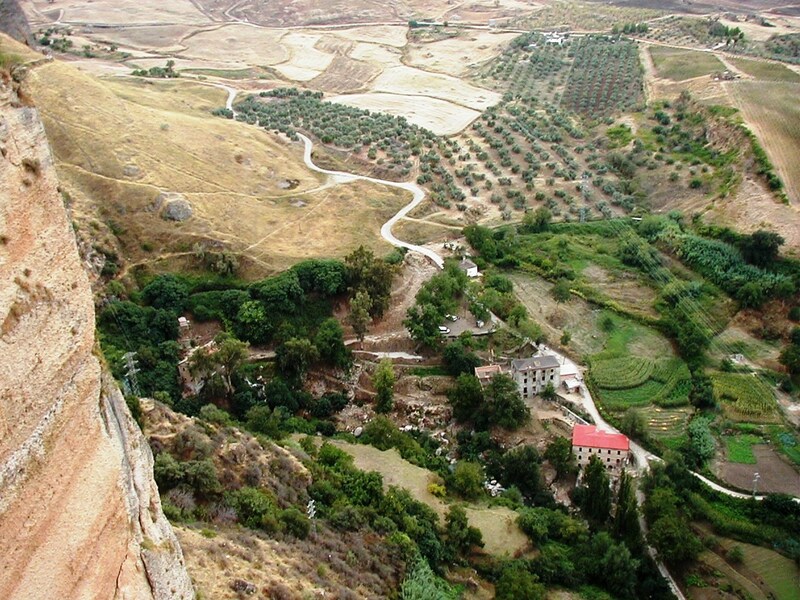 It also happens to be one of the most spectacularly located towns in Andalusia sitting on a massive rocky outcrop straddling a precipitous limestone cleft in the mountains. We parked the car in the new town near the bullring and crossed the Rio Guadalquivir back to the old town with its cobbled narrow alleys, dazzling white houses and decorative black window grilles covered in scarlet geraniums. 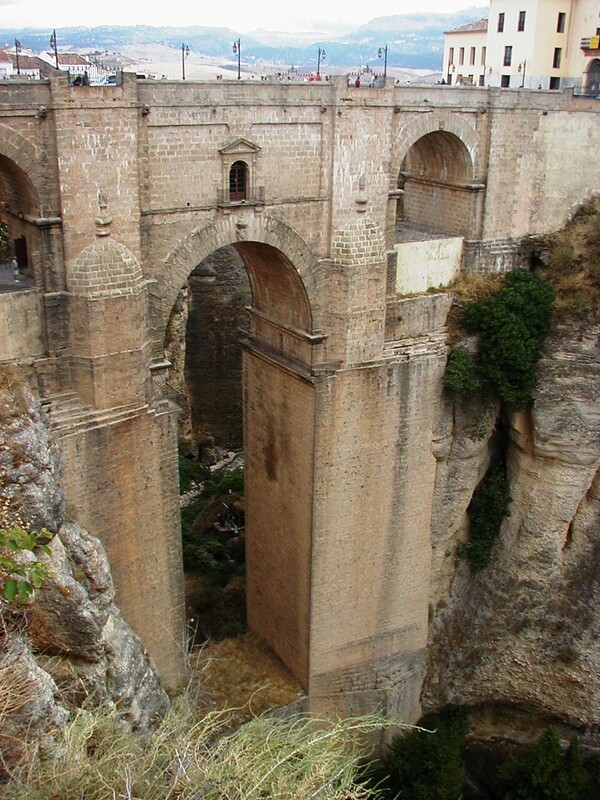 Ronda is most famous for a one hundred and twenty metre high bridge, The Puente Nuevo, whose name means ‘new bridge’, and which spans a gorge that divides the city in two. The bridge was begun in 1751 and took forty-two years to complete. It is supposedly one of the most photographed structures in Spain and often quoted as one of the top places to see in Europe. We crossed the bridge and looked out over the patchwork landscape of burnt brown, cream, beige and copper coloured fields that spilled out across the flat valley plain, terraces of irrigated green, a meandering river far below and a dramatic grey sky full of rain and stormy menace. We walked over the bridge and admired the expansive views over the surrounding countryside and from here it was easy to understand why Ronda was one of the last Moorish strongholds in Spain, only finally falling to the Christian armies in 1485 just seven years before the fall of Granada. It was possible to visit the interior of the bridge by climbing down a set of steps carved into the side of the canyon and then entering a chamber where there was an interesting exhibition in what was once the guard house describing the history of the bridge and its construction. Just behind the guard house was the cramped prison, which allegedly both sides used for imprisonment and torture during the civil war. Although it remained cloudy it was warming up by now so we walked around and through the attractive streets of the old town detouring now and then to viewing platforms built between grand houses and palaces all with stunning views from the top of the gorge. When we had seen most of what we wanted to see on this side of the river we crossed back over the Puento Nuevo and made our way to the bullring museum. is one of the oldest operational bullrings in Spain. The arena has a diameter of sixty-six metres, surrounded by a passage formed by two rings of stone. There are two layers of seating, each with five raised rows and one hundred and thirty-six pillars that make up sixty-eight arches. It is only used once a year for fighting but is important as a Matador training school because Ronda is well-known as the spiritual home of the modern corrida or bullfight. The founder of this style was Francisco Romero, the patriarch of the famous Romero family of Ronda. 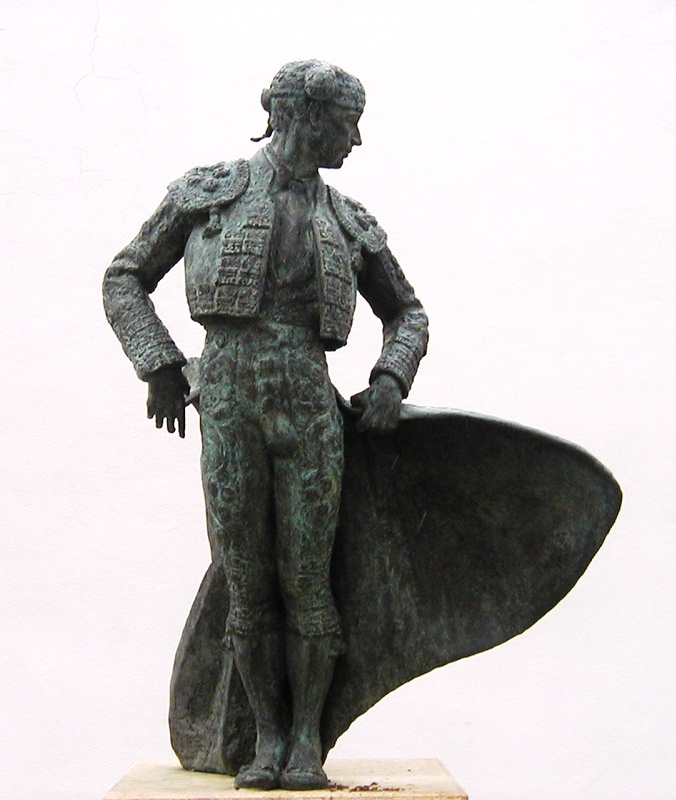 Before Francisco, bullfighting was an activity normally fought from the back of a horse in what was known as the ‘Jerez style’ but Romero introduced the style that we are most familiar with today when the Matador stands and fights on foot. Finished now, we returned to the car and I was glad the weather had improved because this meant a better return journey on the Carreta De Ronda, the tricky twisting A397 and without the miserable rain we were better able to appreciate the scenery and the beauty of the razored edged Sierra Bermeja mountains as they swept back down to the coast and we followed the road back towards the concrete coast of the Costa Del Sol. This entry was posted in Beaches, Europe, History, Natural Environment, Spain, Travel, World Heritage and tagged Bullfight, Culture, Ernest Hemingway, Francisco Romero, Life, Puente Nuevo, Ronda, Ronda Postcards, Spanish Civil War. Bookmark the permalink. How wonderful, Andrew. Adding it to my ever-lengthening list of places I must visit. Thanks. A worthy inclusion on your list, Andrew. All it needs now is a golf course – there could be a few challenging Par 3s in that terrain. Thanks Richard – apart from the issue of the terrain it would probably be ludicrously expensive like most other golf courses in Spain. The surrounding scenery is lovely, Andrew. I really tried to nudge our hire car in that direction when we went to Granada, but the driver was hanging on tight to the wheel. That’s a shame you missed a treat! Did you get into the Alpujarra Mountains when in Granada? After reading Gerald Brenan ‘South from Granada’ I feel that I need to gothere. No, we were heading for the Algarve and Michael was wearing his “going home” expression. It’ll have to be another trip I’m afraid. You read some interesting ‘travel’ books. I always keep an eye on your current read. Enjoyed your account on Ronda. Now, I have to add it to my list of places to visit in Spain. I like the fact you describe it as an “off the beaten path” place away from the usual touristy spots. I just returned from Spain this afternoon. Having visited Ronda just a few days ago, I enjoyed reading your take on this remarkable town and learning a few things as well! Thanks for the comment. I also came back fro Spain a few days ago – I was in Siguenza in Castilla-La Mancha. Sounds like a place to visit and love the tidbits about Hemingway and Welles. They don’t really approve of female matadors in Spain but they are tolerated in Mexico! That bridge -and the views from it- are really astounding! Great post! Andrew I could barely tear my eyes off these spectacular photos to read your post. I know I am easily distracted. Jaw dropping comes to mind. It is a good bridge I have to say. The views are spectacular.